Home » What's New » Can't We All Just Get Along? On a sunny summer day anywhere in the country, outdoor enthusiasts hit the trails in droves to enjoy nature’s splendor. 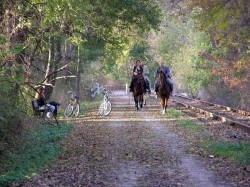 But unfortunately, interactions between hikers, bikers, and equestrians on popular trails can be less than friendly. When altercations occur, tensions mount and emotions run high as the respective user groups rally their troops to defend their “turf”. But instead of protecting rights to trail use, these clashes only foster continued ill-will and misconceptions which can even lead to government intervention and loss of path access for everyone. 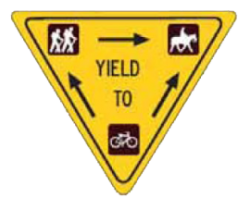 Conflicts can occur because a trail experience for hikers and bikers is very different from horsemen. Horses are live animals whose natural instincts can influence their behaviors and affect the way they react to situations encountered on the trail: they may interpret a speeding bike coming towards them as a moving monster; hikers carrying big backpacks can look like a bear; barking dogs can startle even the steadiest of mounts; and not everyone is familiar with how to yield on the trail to allow a horse enough space to safely pass. On the flip side, many people have very limited exposure to horses, do not know how to act around them, and may even be afraid. Horsemen who thoughtlessly ride their mounts in wet areas or during muddy conditions can cause considerable damage to trails for other users. And no one likes walking or riding a bike through horse manure. Dr. Gregory Miller, President of the American Hiking Society (AHS), believes that the transformation of paths into multi-use routes to meet public demand can also create problems. “Trails may start out as being intended for a particular user group, such as a hiking route through a forest,” he said. “But then other types of users begin to use the area due to high demand, and all of a sudden those narrow paths and sharp corners aren’t necessarily ideal or even safe conditions for everyone.” Regardless of who got there first, the reality is this: public land and open space is being rapidly lost due to continued development and population growth, while at the same time the number of trail users on those shrinking areas is increasing. And misunderstandings only add fuel to these potentially volatile situations. This cooperative attitude is catching on. BCHA, AHS, and IMBA regularly invite representatives from each other’s organizations to speak at national conventions and meetings and work together on issues. While national organizations set positive examples for their membership, the most critical aspect of successful trail sharing between different users starts with individuals taking responsibility and becoming active in their local communities. Riders must take care to avoid an attitude of entitlement to trail use, and take personal responsibility for the open areas they enjoy using. “People need to be connected to a piece of property and recognize the value. If horsemen just ride through, leave poop everywhere, and don’t give back or make any effort, it’s just as bad as hikers coming in for a day picnic and leaving all their trash behind,” said Miller. In addition, horsemen can’t wait until a sudden policy change threatens their trail access. “Make an effort to know who the key people are in your area, and have them know you so that they are aware that you’re using the trails and want to support them,” McGarvey explained. Another key is to learn the policies and processes which affect public land: while every region and open space may be different, the connection made with local officials is invaluable in finding out what applies to a particular area, such as periodic reviews, public meetings, and land management plans. Equestrians can take their organizational efforts even further. Great strides can be made in fostering good relations with other user groups through volunteer work; regularly meeting with representatives from other area user groups (such as local hiking and biking clubs); and embracing opportunities to come together through participation in work days, rides, social events, fundraisers, competitions and events. “These types of joint events can be an opportunity to meet more people and build camaraderie between all groups who enjoy the land, and forget their ‘differences’ as everyone works together for a common goal: a safe and enjoyable experience on the trail,” McGarvey noted.